In ancient times, the Celtic people believed that holly’s purpose was to maintain the beauty of the earth after other trees had lost their leaves. Adorning themselves with sprigs of holly in their hair, they ventured into the forest in search of another beloved plant: mistletoe. Over time, holly has inherited new purposes. It has become a symbol of harmony and happiness, with people settling their disputes beneath the tree’s canopy. Much of the plant’s modern reputation has grown from its unique and distinctive beauty. Its firm white and green leaves that frame vibrant bursts of cheerful red are a natural representation of traditional Christmas colors. Because of this convenient, colorful occurrence, many cultures have adopted – and adapted – holly as a part of their Christmas celebrations. 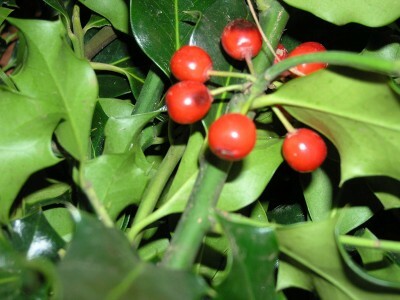 In West England, sprigs of holly are hung from children’s beds to ward off mischievous goblins. In Germany, churches decorate their interiors with the plant during the Christmas season to bring luck. In a sense, holly’s reputation has developed in parallel with timeless Christmas celebrations. As we deck the halls with boughs of holly, we celebrate not simply the passing of another year, nor the culmination of a religious holiday, but our own resilience. In harsh winter storms, birds seek refuge among the flowering branches of the holly tree. It is this resilience – this unexpected, unlikely kindness – that defines the holly and that, ultimately, draws us to it. Whether in wreaths, Christmas trees or by itself, our celebration of holly is a celebration of our own qualities, especially those we hold in esteem during the holiday season. Kindness, truth, generosity and harmony are meanings that holly has developed but, even more, they are qualities that we have come to value as a species, qualities that are enforced and praised during the Christmas season. At Christmas Farms in Southwest Michigan, we encourage everyone to take inspiration from this ancient tree. Be kind. Be generous with one another. As the holly lends its branches to the bird in winter, so should we lend ourselves to our friends and neighbors. And what better way could there be than to celebrate kindness with holly? We offer a vast selection of ornamental wreaths with holly to ensure that, no matter the reason for your generosity, we can provide.